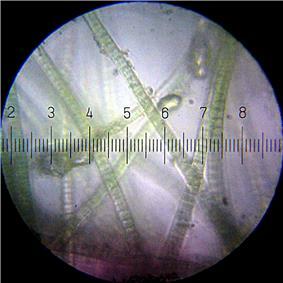 Cyanobacteria such as these carry out photosynthesis. Their emergence foreshadowed the evolution of many photosynthetic plants, changing the earth's atmosphere. Berg IA (2011). fixation pathways"2"Ecological aspects of the distribution of different autotrophic CO. Appl. Environ. Microbiol. 77 (6): 1925–36. Keeling PJ (2004). "Diversity and evolutionary history of plastids and their hosts". Am. J. Bot. 91 (10): 1481–93. Keeling PJ (2009). "Chromalveolates and the evolution of plastids by secondary endosymbiosis" (PDF). J. Eukaryot. Microbiol. 56 (1): 1–8. Keeling PJ (2010). "The endosymbiotic origin, diversification and fate of plastids". Philos. Trans. R. Soc. Lond., B, Biol. Sci. 365 (1541): 729–48. Timme RE, Bachvaroff TR, Delwiche CF (2012). "Broad phylogenomic sampling and the sister lineage of land plants". PLoS ONE 7 (1): e29696. Spiegel FW (2012). "Evolution. Contemplating the first Plantae". Science 335 (6070): 809–10. Price DC, Chan CX, Yoon HS, Yang EC, Qiu H, Weber AP, Schwacke R, Gross J, Blouin NA, Lane C, Reyes-Prieto A, Durnford DG, Neilson JA, Lang BF, Burger G, Steiner JM, Löffelhardt W, Meuser JE, Posewitz MC, Ball S, Arias MC, Henrissat B, Coutinho PM, Rensing SA, Symeonidi A, Doddapaneni H, Green BR, Rajah VD, Boore J, Bhattacharya D. (2012). "Cyanophora paradoxa genome elucidates origin of photosynthesis in algae and plants" (PDF). Science 335 (6070): 843–7. ^ Swan BK, Martinez-Garcia M, Preston CM, Sczyrba A, Woyke T, Lamy D, Reinthaler T, Poulton NJ, Masland ED, Gomez ML, Sieracki ME, DeLong EF, Herndl GJ, Stepanauskas R (2011). "Potential for chemolithoautotrophy among ubiquitous bacteria lineages in the dark ocean". Science 333 (6047): 1296–300. ^ Brasier M, McLoughlin N, Green O, Wacey D (2006). "A fresh look at the fossil evidence for early Archaean cellular life". Philos. Trans. R. Soc. Lond., B, Biol. Sci. 361 (1470): 887–902. ^ Tomitani A, Knoll AH, Cavanaugh CM, Ohno T (2006). "The evolutionary diversification of cyanobacteria: molecular-phylogenetic and paleontological perspectives". Proc. Natl. Acad. Sci. U.S.A. 103 (14): 5442–7. ^ Kopp RE, Kirschvink JL, Hilburn IA, Nash CZ (2005). "The Paleoproterozoic snowball Earth: a climate disaster triggered by the evolution of oxygenic photosynthesis". Proc. Natl. Acad. Sci. U.S.A. 102 (32): 11131–6. ^ Dodd AN, Borland AM, Haslam RP, Griffiths H, Maxwell K (2002). "Crassulacean acid metabolism: plastic, fantastic". J. Exp. Bot. 53 (369): 569–580. ^ a b c O'Leary MH (1988). "Carbon isotopes in photosynthesis". BioScience 38 (5): 328–336. ^ Sage RF, Meirong L, Monson RK (1999). "16. The Taxonomic Distribution of C4 Photosynthesis". In Sage RF, Monson RK. C4 Plant Biology. pp. 551–580. ^ Evans MC, Buchanan BB, Arnon DI (1966). "A new ferredoxin-dependent carbon reduction cycle in a photosynthetic bacterium". Proc. Natl. Acad. Sci. U.S.A. 55 (4): 928–34. ^ Ljungdahl L, Wood HG (1965). "Incorporation of C-14 from carbon dioxide into sugar phosphates, carboxylic acids, and amino acids by Clostridium thermoaceticum". J. Bacteriol. 89: 1055–64. ^ Ljungdahl LG (2009). "A life with acetogens, thermophiles, and cellulolytic anaerobes". Annu. Rev. Microbiol. 63: 1–25. ^ Herter S, Fuchs G, Bacher A, Eisenreich W (2002). "A bicyclic autotrophic CO2 fixation pathway in Chloroflexus aurantiacus". J. Biol. Chem. 277 (23): 20277–83. ^ Zarzycki J, Brecht V, Müller M, Fuchs G (2009). fixation cycle in Chloroflexus aurantiacus"2"Identifying the missing steps of the autotrophic 3-hydroxypropionate CO. Proc. Natl. Acad. Sci. U.S.A. 106 (50): 21317–22. ^ Berg IA, Kockelkorn D, Buckel W, Fuchs G (2007). "A 3-hydroxypropionate/4-hydroxybutyrate autotrophic carbon dioxide assimilation pathway in Archaea". Science 318 (5857): 1782–6. ^ Huber H, Gallenberger M, Jahn U, Eylert E, Berg IA, Kockelkorn D, Eisenreich W, Fuchs G (2008). "A dicarboxylate/4-hydroxybutyrate autotrophic carbon assimilation cycle in the hyperthermophilic Archaeum Ignicoccus hospitalis". Proc. Natl. Acad. Sci. U.S.A. 105 (22): 7851–6. ^ Encyclopedia of Microbiology. Academic Press. 2009. pp. 83–84. ^ Nicole Kresge, Robert D. Simoni, Robert L. Hill (2005). "The Discovery of Heterotrophic Carbon Dioxide Fixation by Harland G. Wood". The Journal of Biological Chemistry. Some carboxylases, particularly RuBisCO, preferentially bind the lighter carbon stable isotope carbon-12 over the heavier carbon-13. This is known as carbon isotope discrimination and results in carbon-12 to carbon-13 ratios in the plant that are lower than in the free air. Measurement of this ratio is important in the evaluation of water use efficiency in plants, and also in assessing the possible or likely sources of carbon in global carbon cycle studies. Although almost all heterotrophs cannot synthesize complete organic molecules from carbon dioxide, some carbon dioxide is incorporated in their metabolism. Notably pyruvate carboxylase consumes carbon dioxide (as bicarbonate ions) as part of gluconeogenesis, and carbon dioxide is consumed in various anaplerotic reactions. hydrogen gas or hydrogen sulfide). Sulfur- and hydrogen-oxidizing bacteria often use the Calvin cycle or the reductive citric acid cycle. A variant of the 3-hydroxypropionate pathway was found to operate in aerobic extreme thermoacidophile archaeon Metallosphaera sedula. This pathway, called the 3-hydroxypropionate/4-hydroxybutyrate cycle . And yet another variant of the 3-hydroxypropionate pathway is the dicarboxylate/4-hydroxybutyrate cycle. It was discovered in anaerobic archaea. It was proposed in 2008 for the hyperthermophile archeon Ignicoccus hospitalis. The 3-hydroxypropionate cycle is utilized only by green nonsulfur bacteria. It was proposed in 2002 for the anoxygenic photosynthetic Chloroflexus aurantiacus. None of the enzymes that participate in the 3-hydroxypropionate cycle are especially oxygen sensitive. The reductive acetyl CoA pathway operated in strictly anaerobic bacteria (acetogens) and archaea (methanogens). The pathway was proposed in 1965 by Ljungdahl and Wood. They were working with the gram-positive acetic acid producing bacterium Clostridium thermoaceticum, which is now named Moorella thermoacetica. Hydrogenotrophic methanogenesis, which is only found in certain archaea and accounts fror 80% of global methanogenesis, is also based on the reductive acetyl CoA pathway. The pathway is often referred to as the Wood-Ljungdahl pathway. The anaerobic and microaerobic bacteria. It was proposed in 1966 by Evans, Buchanan and Arnon who were working with the anoxygenic photosynthetic green sulfur bacterium that they called Chlorobium thiosulfatophilum. The reductive citric acid cycle is sometimes called the Arnon-Buchanan cycle. Of the five other autotrophic pathways, two are known only in bacteria, two only in archaea, and one in both bacteria and archaea. The large majority of plants are C3 plants. They are so-called to distinguish them from the CAM and C4 plants, and because the carboxylation products of the Calvin cycle are 3-carbon compounds. They lack C4 dicarboxylic acid cycles, and therefore have higher carbon dioxide compensation points than CAM or C4 plants. C3 plants have a carbon isotope signature of -24 to -33‰. C4 plants preface the Calvin cycle with reactions that incorporate CO2 into one of the 4-carbon compounds, malic acid or aspartic acid. C4 plants have a distinctive internal leaf anatomy. Tropical grasses, such as sugar cane and maize are C4 plants, but there are many broadleaf plants that are C4. Overall, 7600 species of terrestrial plants use C4 carbon fixation, representing around 3% of all species. These plants have a carbon isotope signature of -16 to -10 ‰. CAM plants that use Crassulacean acid metabolism as an adaptation for arid conditions. CO2 enters through the stomata during the night and is converted into the 4-carbon compound, malic acid, which releases CO2 for use in the Calvin cycle during the day, when the stomata are closed. The jade plant (Crassula ovata) and cacti are typical of CAM plants. Sixteen thousand species of plants use CAM. These plants have a carbon isotope signature of -20 to -10 ‰. catalyzed by PEP carboxylase (PEPC), to carboxylate phosphoenolpyruvate (PEP) to oxaloacetate (OAA) which is a C4 dicarboxylic acid. Many photosynthetic organisms have acquired inorganic carbon concentrating mechanisms (CCM), which increase the concentration of carbon dioxide available to the initial carboxylase of the Calvin cycle, the enzyme photorespiration. CCM can make plants more tolerant of heat and water stress. Six autotrophic carbon fixation pathways are known as of 2011. The Calvin cycle fixes carbon in the chloroplasts of plants and algae, and in the cyanobacteria. It also fixes carbon in the anoxygenic photosynthetic proteobacteria called purple bacteria, and in some non-phototrophic proteobacteria. It is estimated that approximately 258 billion tons of carbon dioxide are converted by photosynthesis annually. The majority of the fixation occurs in marine environments, especially areas of high nutrients. The gross amount of carbon dioxide fixed is much larger since approximately 40% is consumed by respiration following photosynthesis. Given the scale of this process, it is understandable that RuBisCO is the most abundant protein on earth. Graphic showing net annual amounts of CO2 fixation by land and sea-based organisms.